All after school programs & workshops run 45-60 minutes and include an energetic class scientist. Programming for after-school groups can be difficult, considering that the kids have already been in school all day long. That’s why the Eric Energy show is perfect…it’s full of action and fun, lights and sound, music and humor AND it’s educational. It’s a science show and it’s guaranteed to engage every child in the room. The kids will be participants in experiments and the whole group will be amazed while they also learn valuable facts and concepts related to weather, power, liquids, gasses, energy…and so much more. There is a student minimum for each class. All classes are appropriate for grades K-5. Some classes may include a take home experiment. Kids will learn about the 3 states of matter, the 4th state and materials that do not qualify. They will see dry ice, learn the safety involved and see several visual experiments. Everyone will participate in a few experiments. Kids will learn about sound, how it travels and how you hear it. They will see and participate with a voice changer. Everyone will create and take home an experiment. Kids will learn about light, the different types and how you see it. They will see many different laser lights and learn the safety precautions. Everyone will participate in a laser dance party. Kids will learn about the different types of electricity and how it's made. They will see indoor lightning, a hair raising experiment and a human circuit. Everyone will participate in a few experiments. Kids will learn about atoms, molecules and polymers. They will see long chained molecules, melting styrofoam and slime! 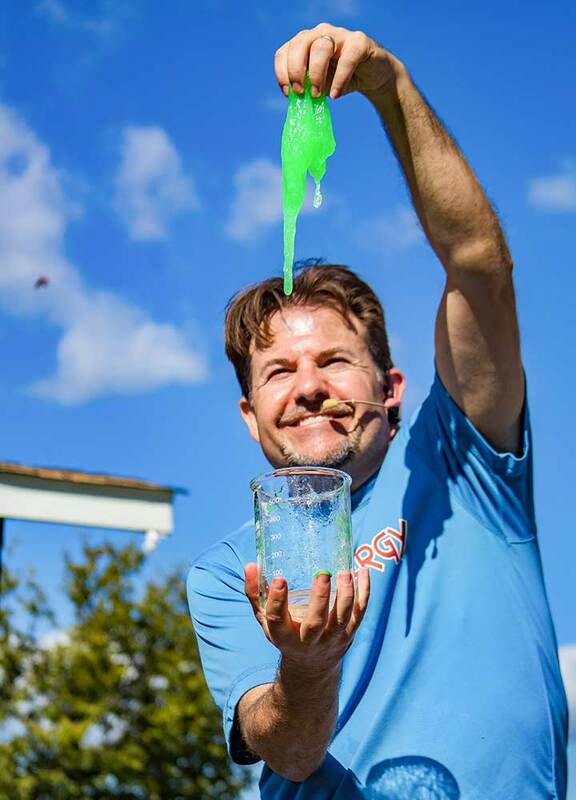 Everyone will get to make and take home a covered cup of slime. Kids will learn about the science and history of yo-yo's. They will see amazing tricks, a human yo-yo and learn how to yo. Everyone will participate in a yo-yo workshop. Kids will learn about molecular gastronomy or "Food Science". They will see acid/base reactions and cool experiments. We will make chewing gum and everyone gets a piece. Kids will learn that some things are afraid of the water. They will see how some substances do not mix and other cool experiments. Everyone will create a lava lamp to take home. Kids will learn about chemical reactions. They will see several experiments and "explosions". Everyone will get an experiment to do at home. Kids will learn about air streams. They will see vortex fog rings and participate in several experiments. Everyone will compete in a vortex ring competition.